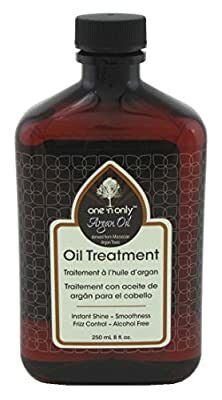 One ‘n Only™ Argan Oil Oil Treatment. This alcohol-free, non-greasy oil treatment is instantly absorbed into the hair – and leaves stunning shine with no oily residue. The treatment smoothes cuticles and creates silky, conditioned, and healthy-looking hair. 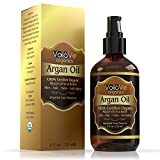 Providing long-term conditioning, this precious oil helps to protect hair against damage caused by the environment, chemicals, and excessive heat from stylers. 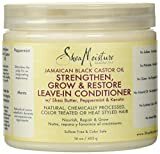 It also helps reduce frizz, split ends, and breakage. Looking for a premium styling, finishing, smoothing, and conditioning product? And one that gives consistently silky smooth results? You’ve found it in One ‘n Only™ Argan Oil Oil Treatment. One of the world's rarest oils, argan oil is derived from the Argan Tree. Rich in essential fatty acids, Omega 6 and Vitamin E, it is valued for its ability to regenerate and nourish dry and damaged hair. 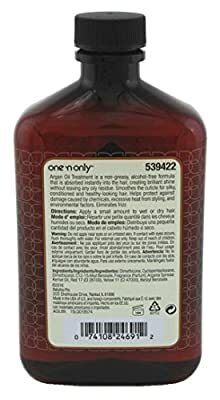 one 'n only Argan Oil is a premium finishing, smoothing and conditioning product. This non greasy, alcohol free formula instantly absorbed into the hair, creating brilliant shine without leaving an oily residue. Smooths cuticle for the silky, conditioned and healthy looking hair. 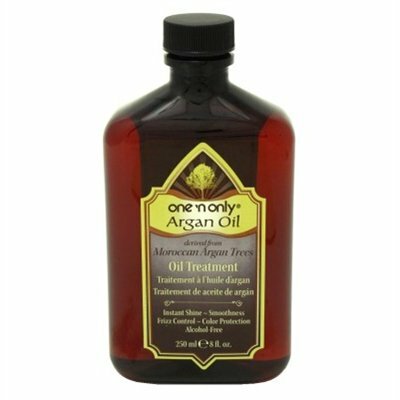 One 'n Only Argan Oil Treatment method is a special finishing, smoothing and conditioning item derived from Argan Trees.